Coping with Change - Ask Leo! Hi, everyone! I’m Leo Notenboom. I help computer users like you make technology work so that you’re less frustrated and more productive and connected. In these next five videos, I’m going to spend a little bit of time talking about what I think are some of the most important things that you can do to get the most out of your computer, your phone, your technology in general. Some are going to be specific things that you should be doing right now to keep yourself safe and secure. You can probably guess what some of those are but I’ll keep you in suspense for a bit. Others are going to be perhaps a little less familiar; maybe a little bit surprising but also from my perspective, incredibly important to making the entire technology experience less frustrating for you. So, what’s first on my list? I’ll put it this way. One of the best things that you can do to reduce frustration when it comes to technology is simply to cope better in the face of change. Now, before you jump on me, I’m not saying just blindly accept change – not at all. But I see how you choose to cope with change, you choose to deal with change as being one of the biggest sources of both frustration and the biggest opportunity for making your experience, well, less frustrating. Again, by the choices you make. You and I both know – change is inevitable; it just is especially when it comes to technology. Take a look at where we are today. We wouldn’t have gotten here without massive amounts of change. And yes, it has been said and it is very, very true: not every change is an improvement but every improvement requires change. Like I said, the amount of change we face over the course of a lifetime is staggering, absolutely staggering. Most of it is actually pretty darn good. Some of it, meh, not so much. Now visceral resistance to change is perhaps one of the most frustrating things I hear as I answer questions and talk with people relating to Ask Leo! I hear it unfortunately, fairly often. Certainly more often than I would like to. And it’s not because I want people to just blindly accept change. I’ll get to that in a minute but it’s definitely not that. Even though I’m a person who is very embracing of change, I’m not suggesting everybody needs to do that because it’s just not true. The problem is that people get so worked up about change; they get angry; they get frustrated; they even get depressed when they’re faced with change. But it’s all anger and frustration and depression without a purpose. Nothing good can come of it. Unfortunately, it also feeds on itself to the point where people start rejecting change just out of hand – any change no matter how good or potentially beneficial or how small. It’s just rejected because it’s change and they get frustrated with every bit of change that comes along. It causes people to focus on that, “not every change is an improvement” part of the statement and throw it out, the part where every improvement requires change. You’ve probably seen or heard exactly this. This kind of a reaction is both common and to me, at least, a really sad waste of energy. Why do some folks resist change so much? Well, I did a little bit of research and it led me to a book that lists six different reasons that I’m going to talk about here and paraphrase a little. One, reluctance to lose control. Yeah, control. I get that one. All about control. Loss of control when it feels like changes are being forced on you. Two, lack of physiological resistance, i.e. confidence. A lack of confidence that you’re actually capable of dealing with, either the change or the results of the change that you’re faced with. Three, an intolerance of the adjustment period involved in change. That’s just fancy words for time. A reluctance or inability to invest the time required to cope with a particular piece of change. Four, a preference for low-levels of stimulation and novelty. Well, I look at that as just saying some change is too big. I call it “scope of the change is too overwhelming”. Feeling overwhelmed with the size of some kind of change that you’re faced with. Five, reluctance to give up old habits. I call that comfort. Feeling comfortable in old ways and not wanting to give up that comfort. And six, what they call “cognitive rigidity”. I just call it rigidity. Being a person who’s generally fixed in your ways. So, what’s the cost of all this resistance of change. Well, you might think, like I said earlier, my biggest concern might be the opportunity cost. In other words, the cost of not moving ahead with new technologies, the changes that come down the pike and so forth. It’s a cost – absolutely but it is nowhere near my biggest concern. My biggest concern will probably surprise you. Resistance like this, resistance to change makes you unhappy. Again, I’m not talking about just taking and accepting change but this active and angry frustration that people choose to feel that results from almost any change. It feeds on itself. The more things change around you and the more isolated you feel, the grumpier you get and the less likely you are to accept any change at all. What’s the solution? What is it that I’m suggesting you do? Well, I can tell you a couple of things off the top that I don’t want you to do. One, is I don’t want you to get frustrated. I don’t want you to get angry. As you can tell, my sense is that’s a bad thing. I don’t want you to be unhappy and I don’t want you to suffer. I see it as a waste of energy and sad. I also don’t want you to blindly accept every change. I’m not arguing for that. If you’re change averse for just about any reason, blindly accepting change or feeling like you need to blindly accept change will actually only make things worse. I don’t want that either. That still ends up with that same thing that I don’t want you to have; I don’t want you to be frustrated; I don’t want you to be unhappy. I don’t want you to suffer. Let’s look at those six reasons for resistance to change and see if we can’t talk about something relating to each one of them. First, control. So, take control. Make change a choice and not a challenge. Here’s a shocker for you: all marketing to the contrary, rarely is change required or truly forced on you. You don’t have to take every change. You can choose to delay until you see a need or reasons for the change. Not everyone needs to be an early adopter. Avoid the hype. Here is one great example: Windows XP. Now, it’s not a decision that I personally endorse but many people have made a conscious decision to stay with Windows XP rather than move ahead to newer versions of Windows. They made a choice. They’re in control. Hopefully, they evaluated the risks, which as it turned out, turned out to be much less than the hype and made a conscious decision to stick with Windows XP. Maybe they made a different choice. Maybe they made a different choice to move to a different operating system like Mac or Linux or something like that but nonetheless, those folks made a choice in the face of what seemed like required change. Again, change, when to make it and what change to make remains ultimately something you can often choose. And ultimately, that leaves you in control. Confidence. I’ve got two things for you here. One is one of the wonderful changes that’s happened over the last decade or so is the proliferation of resources for just about anything. The number of websites like Ask Leo! or YouTube videos or users groups or newsletters or forums or support sites or just about anything you can think of has just gotten so huge there’s just so much help out there if you’re willing to go out and look for it and of course, number two (you knew I was going to slide this in somehow) backups. When it comes to your computer, nothing can save you like a full image backup of the machine. 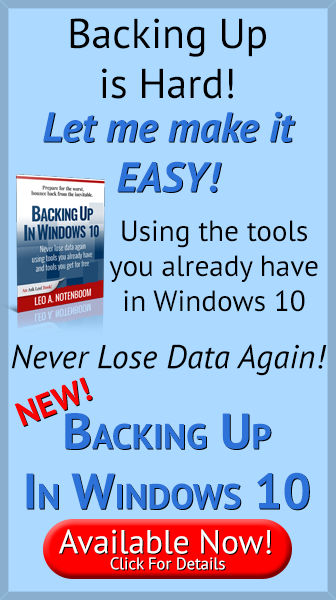 But what most people don’t quite grasp is that having that backup frees you. It frees you to go try things, to experiment, to play rather than be afraid of whatever change it is you’re faced with. Why? Because if something does go wrong, if you screw your machine up completely, what do you do? You restore to the backup you took before you began. Everything’s back the way it was. Whatever mistakes you made, they had no long-term impact. Whatever broke isn’t broken anymore. It’s only software. Software is just something you can put back on the machine and a backup is a way to take a snapshot of exactly how that machine was operating at a point in time. I can’t stress it enough. You can always restore to recover where you were before you decided to take a change or play with something or just do something that you weren’t completely certain of. It’s the biggest confidence builder I know of. Build yourself a safety net. Be it online resources or a local users group or a nearby friend or even a nearby teenager, they can all be sources of information that can give you more confidence to deal with whatever it is you’re dealing with. Confidence is interesting. Confidence is awesome because it also, kind of like frustration builds on itself. In other words, you get a little bit of confidence by doing a little bit of something and it works. Then you accomplish a little bit more and you build a little bit more confidence. The more you do, the more you find out things are ok. The more confidence you build. Scope. So, speaking of small steps, some changes come at us all at once or at least they seem like it. As it turns out, that’s actually relatively rare. We can usually break down most large changes into smaller; I’ll call them bite-sized chunks. So, choose your battles. Rather than feeling you have to take it on all at once, you don’t. Make a small corner and work on just that. And once you’re comfortable with that piece of whatever change it is you’re dealing with, move on. Take a little bit more. Eventually you’ll find out that you’ve actually accomplished and adjusted to quite a bit. For example, a big one from a few years ago – moving from Office’s menu based system to the ribbon interface. A big change. At least it seemed that way. But underneath it all, typing, in other words just creating your documents, entering in whatever it is you’re entering in, that part at least, hasn’t change that much. So, you can still use the program and now we can choose pieces of the program to focus on, to get used to, to get more comfortable, to adapt or adjust or take on the change that we’re faced with. For example, what’s important? Saving documents. Opening and saving documents so maybe start with that. Just focus on understanding on that has changed in the more recent versions of Office. Once you’ve got that under your belt, move on to something else. Maybe simple formatting: bold, italics, fonts, that kind of stuff. Play with that some. Get that down in you documents. Once you’re comfortable with that, move on to something else. Very slowly you’ll end up taking on everything you need. You don’t need to take on the entire ribbon interface. I don’t even know everything that’s on that ribbon interface and how to make it all work but I know how to make what I need work and that’s all you need. And if you just do that piece-by-piece, it’s the old story about how to eat an elephant – one bite at a time. Eventually you find out that you’ve eaten a lot of elephant. Time. Sometimes change can really seem overwhelming particularly if it is large and if we’re under the gun. So to the degree that you can, combine some of the things that we’ve talked about so far to deal with this idea of time. Choose which changes to make and when to take them. You don’t have to take all changes right away. Choose small pieces of the change. In other words, like I said earlier with the ribbon interface, just choose a small piece of it. You don’t have to learn the entire thing all at once. Choose a time for that change to start playing with it when you’ll feel like you’ll have the time to deal with it. A counter example, don’t switch Office to the ribbon interface the night before your big paper or presentation or whatever is due. That’s a recipe for disaster; that’s a recipe for frustration. Do that change at some point in time when you have the time to feel more comfortable exploring and taking those smaller bites of change to understand what’s going on. Break it down into smaller steps. Take each one of those at a time. Comfort. So, getting pushed out of our comfort zone, it’s uncomfortable. That’s like the definition. My advice here is to remember that many of the changes really end up being improvements. Often, often, even if you don’t see it right away. For those that have done both, I suspect that driving a car with an automatic was probably a pretty big and uncomfortable change when the time came but now it probably seems pretty natural and for a lot of people, preferable. Even switching from a typewriter to a word processor, a massive, massive change when you think about it. It’s something that looked incredibly daunting going in but most folks would never think of going back. Look for the opportunities, the hints, the clues, the promises that the change you’re faced with might very well be an improvement over where you are today. Keep an open mind. Don’t react but examine. Choose. Look for the opportunities, the hints, the clues the promises, even read at least, a little bit of the hype and understand to see if there’s a promise of improvement behind the change that you’re faced with. It’s not always going to be there. I totally get that but if you can approach with an open mind, that will at least give you the opportunity to see that yeah, you know, maybe after all is said and done, maybe if I take this all on, things will, in fact, in some, be an improvement over where I am today. Rigidity. So I thought about this one a lot and unfortunately, I don’t really have a good solution here. If you simply are a person who just can’t change, who is so fixed in your ways that you really consider yourself fundamentally incapable of change, I have nothing for you other than sympathy because ultimately I believe that if that’s where you are, you’re looking at leading fairly unhappy life in the face of all of this inevitable change. So, I’m hoping that if nothing else, you can at least maybe reconsider and think about becoming or at least trying to become a little bit more accepting of the change that’s happening around you. My single biggest concern regardless of any of these is simply that you not react to change but instead make choices. Make a choice to reject change if that’s appropriate for your situation. Make a choice to delay change if that could help you in the long run deal with whatever it is. Make a choice to accept change if you can see the potential of value of whatever it is the change that you’re looking at it. Make a choice to embrace it if the change in front of you inspires you. I’m sure that happens from time-to-time as well. So, even from this side of the camera I can already hear people sputtering, “But, but, but…” look I get it; I really do. Not everything that I’ve talked about applies in every situation and I’m not in any way suggesting that change is something that is simple or easy to always accept but the one thing we know, the one thing I think we can all agree on is that change is inevitable and that it’s required for growth and even the betterment of our society as a whole. Not every change is an improvement but every improvement is change. What you can control is how you react to change; how you can handle change. What choices you make when faced with change and of course, whether or not you choose to get grumpy. Even in the face of seemingly constant change, not all of which you might or even need to agree with, you can make choices that will make you less frustrated. Maybe not surprisingly, but I have found that technology works better for people who are less frustrated. Take two people, otherwise identical; faced with the same kind of situation relating to change, the person who is less frustrated will have a better experience. They just will. That’s the way it works. Ultimately, what I really want for you is to remove the frustration that you feel and replace it with this wonder and awe that I feel every day often because of change. Let me know what you think. As always, there’s a link here for you to go click on. Visit me on askleo.com. Leave a comment on the page hosting this video. All the comments are moderated. All the comment are read. Agree with me, disagree with me, that’s ok. I just love to hear what you have to say. Change is a big issue for a lot of people and I can’t claim to have THE answer but if nothing else, hopefully I’ve given you a few things to think about when it comes to facing change that you may or may not agree with or simply change that you’re very uncomfortable with. The next video I’ll talk about something else on the road to our five things to make technology a little bit easier to deal with and more effective. Until then, I’m Leo Notenboom for askleo.com. Take care, everyone! Coping With Change - In processing just a few of the responses to my survey of a few weeks ago it's apparent that dealing with change is a bigger issue now than ever. Unfortunately since I embrace change so readily it leaves me at a disadvantage trying to help people cope. That's where you come in. How I Deal With Inexplicable Change - Yes, I deal with frustrating changes as well. It's not that I never get frustrated; it's what I choose next that makes for a much happier experience. Change for the Sake of Change? - I hear often from people complaining that the latest update to their favorite software is just "change for the sake of change". No. Simply .... no. Embracing the Most Important Attitude - There is one approach to life, one setting in our psyche, that will affect your experience with technology much more than any lack of skill or knowledge. Well said. An impressive analysis to make us think, and we must hope, accept and even adopt change with a little less pain, and a little more understanding. I look forward to your further tips with considerable interest, and appreciation and thanks for your thoughts. The first change i dealt, with with computers, was changing from DOS to Windows. I did not like it at first but as I got use to using it I saw it was better. The second was changing from keystrokes to mouse. I liked that change a lot. Most of the time I enjoy learning to use the changes in programs. Thank you for taking the time to create these videos. Very good article. There is one thing you didn’t mention — and shouldn’t, given that it’s a dead end situation. I provide computer tech support to a number of friends. I find the reason I have to constantly “fix” things and repeatedly explain how they can fix it or do something themselves, is because they are “learning disabled”. IOW, there is not the slightest desire or curiosity to find out how things work/how to do things. They get to this position because way back when they got their first computer, they didn’t invest the time to learn how it worked. They maintained that attitude throughout their entire computer experience, so now have an almost insurmountable mountain to climb. It’s sad. I agree completely about people not wanting to learn how the computer works and how to fix things themselves. I help people that write down the exact steps that is takes to do something that they want/need to do on their computer. And when they happen to hit a wrong key and things don’t look familiar, they are lost. They don’t want to know or realize that there are several ways to do most things on a computer but they are only interested in one way. It is sad but that is the world we live in. I could go a rant about presidential candidates but choke back my righteous indignation. One day in 1989, signing into my new unit, I found I’d have a staff job requiring the ability to produce reports on a computer. The light came on: my career was going to end prematurely if I didn’t get onboard, and quickly. Fortunately, that assignment was in Seoul, which had shops full of pirated software (like Norton Utilities) and books. I bought them, studied the books and played with the software at night on the office computer (saved many times by Mr Norton). I learned DOS thanks to a patient co-worker … and found I LOVED computers. Something about the logic, the rules, the ability to easily fix a word on a screen instead of with that white liquid erase mess. I never looked back. In the following years of course I’d build my own computers. I taught A+ equivalent courses in the Army. I picked up a few low level certifications, enough to work in computer support in Iraq and AFG after retirement, making my senior years a lot more comfortable. Many thanks, Leo. Your column is one of my favorites. I so much appreciate your sharing your knowledge with us, and having the ability to express it so ably. Thanks very much for the video. I’m an 83 year old man who is quite frustrated by change, especially when I believe I don’t need it at this stage in my life. Due to your video, I’m having second thoughts about my attitude towards change and will try to keep an open mind as I look forward to the next tip in this series. Again, my thanks. Leo – great analysis and I agree with all you say, that’s a very thoughtful piece. But I think you have either missed completely, or skated over, the elephant in the room when it comes to changes in desktop/laptop computing. You might remember I commented about this some years ago, last time the topic came up on your site, and I still have the same issue with change in the world of desktop/laptop operating systems (OSs)and software (apps) as I did then. The changes have ceased to be cost-effective. The improvements we have gained from changes to OSs and apps in the last 5 years – I’ll stick my neck out and say possibly 10 years – are not cost effective because the cost of the time needed to retrain users is not being recouped by productivity benefits. I am not talking about hardware or ecommerce – the changes in those areas have definitely been cost effective. But the routine tasks that 99% of us do every day in offices, home offices, and on the move could be done just as efficiently on desktop and laptop PCs with the OSs and apps we had 5 years ago. In my case I would be perfectly happy to still be using the version of Excel I was running on my Mac SE30 in 1988 (I wouldn’t want the screen size though!). I wouldn’t go back to Word Perfect for anything, but the version of Word I was using around 1995 would still do all I need it to do today. And I’m not unique. A senior lawyer I know reckons that the ribbon cost him about £1,000 in lost charge-out time while he learned how to use the new layout. A bond broker in the City of London used intemperate language on his widely-read (restricted access) blog to complain about the time he had lost because he had to re-learn Excel commands. What about the quality time with family that people have to forego in the evenings & weekends because they are self-employed and can’t spare the time to learn about changes in their working hours? My big regret is that the industry seems to believe that constant change needs to be part of their business model. So I guess we have to just keep paying for the re-training until someone offers a stable OS and suite of stable business apps that don’t change so often and make their changes in small increments so that it’s quicker (and therefore cheaper) to retrain users. The first time I looked Windows 7, I had the same impression. This is going to cost companies millions of dollars in training. Companies can’t just throw a new interface at workers and expect them to immediately understand how to use it. But Leo isn’t defending these changes. He’s saying that these changes are a fact of life, and you’ll just have to “accept the things you can’t change.” In most cases, people eventually learn to use and like the new changes. Do I think Microsoft did the right thing? No. But they did, and that’s what we have to work with now. I am going to play devil’s advocate (I have to include that hint). You have missed the point. Companies like MS (and Ford and Chev and Dior and Channel etc) introduce change for the sake of change to DRIVE SALES, to INCREASE revenues/profits. Look at the new features list in Office 2007, when the ribbon was introduced. There were very few other “new features”. If the ribbon hadn’t been added, there would have been no “improvement’ to drive sales … (in MS marketing opinion, not mine). The ribbon was a big example of MS “planning for future users, ignoring existing users”. The theory was that the ribbon was “easier to learn”, but primarily for new users. Existing users were lost for a long time. It was sad, MS missed a very simple crowd pleaser. All they had to do was include a way of using the menu in Office 2007. Even if they buried the switch deep in the Options, people would have been happier and then they would have had the option of learning the ribbon on their own time. Or look at Windows 8 “Metro”. It was default, in your face and earth shakingly different. What sane keyboard PC user would imagine that using the mouse wheel to “scroll down” would shift the start “scream” to the right … . I certainly didn’t the first time I tried the Win 8 preview version. I actually uninstalled Win 8 after a couple of hours. I didn’t have any smart phone or tablet exposure at the time, and hadn’t read anything about it so Metro was all “Greek” to me. 6 months of reading later, I’d learned enough to be able to work around the differences. In the end, after some tweaking (default load desktop, Stardock Fences to keep shortcuts in place) I stuck with Win 8. Actually, I spend 99% of my time in the Win 8 desktop. The remaining 1% I use the Start Screen “type to search” feature. I really like that Win 8 feature, and I find that my old “Vista” class computer runs slightly better on Win 8. Actually, I made similar statements about the Ribbon when it came out. When Office 6 came out, Word included a setting to work with Word Perfect 5 shortcut keys which I used for years as they were faster than the toolbar and menus. I thought they should have done something similar with backwards compatibility with their previous versions. All MS would have had to do in a case like that was add a ribbon with the old commands. I quickly got use to the ribbon and especially the quick access toolbar, but I work with people who take much longer to learn. Good video, all well said. Will give me food for thought to pass on to my Windows 10 classes with older individuals. I assume you meant coping and not the chemotherapy procedure. You’re right, it’s fixed now. are now concentrating on a growing profit center, e.g., “cloud” data storage. new technical and/or administrative pc changes is the sane way to go. Your technical videos and articles on computer related technical matters are some of the most clear, concise and helpful that I have heard and read, and I constantly refer my friends and colleagues to them. However, over the last several months, you seem to have drifted away from your “core business” into what could be best described as “lifestyle” articles. With the greatest respect, I would like to humbly suggest you go back to doing “what you do best”. It’s a delicate balance – right now I’m finding that these “lifestyle” issues are impacting more people in more ways than specific technical issues, so I’m electing to spend a little time on them. Not to worry, core how-to information won’t go away. Personally, I’m in the space where I expect that the technology I use is going to continue to change (just like it always has! ), so I deal with it with very little angst. Just like you say in your video, I adopt some things right away and wait on others. Going from Windows XP straight into Windows 8.1 was frustrating for a few days, but I knew I’d adapt, and sure enough within a week I was fine. Time spent complaining about it would have just slowed me down. I haven’t added anything to what you’ve already said, Leo 🙂 Thanks for your thoughtful comments. Great advice Leo. What a great way to address a very basic issue for most people when it comes to tech and life !!!!! Hi Leo, I’ve been enjoying your articles and videos now for a very long time and look forward to you email each week. I have just listened to your most recent video, Coping With Change. I’d like to comment that my problem has always been the fact that when I have to deal with something new (or change), I find most of the time that what is Supposed to happen is not the same as what Actually happens and in the process, can get totally lost. Also, I’m always afraid that any change/addition will mess something else up in the process (which certainly does happen). Absolutely – many companies handle change poorly. My advice? Expect it! Don’t let it frustrate you, but rather step back and take the time to figure it out without getting (too 🙂 ) frustrated. As for fear – well, I addressed that in the video: BACK UP! With a back up you can mess up almost whatever you like without worry since you can always restore to the most recent backup. Great article on change. At 72 I hate change but I also realize that a lot of it makes things better. I still run MS Office 2003 on some computers. My personal version of MS Office is 2010. I just don’t have to have the latest version from Microsoft. Those old versions will do a lot more than I need to do. I am not involved in the business world that much so I can get by with my resistance to change in this instance. On the other hand, I run Linux on my laptop and one of my desktops. I prefer Linux for my day to day computing and want the latest stable version, not the testing version. My little computer knowledge is what I have gleaned and able to understand on my own; no formal training. I am still learning since computers is one of my hobbies. The other hobby is golf. They both are frustrating at times and good at times. Maybe I will be able to increase my knowledge and capabilities in computing. I sure don’t seem to be able to gain a great level of proficiency with my golf game. But I am not giving up! Thanks for you efforts to help people like me, Leo. If this article could be presented at businesses, there would not be the kind of productivity loss mentioned above as I have found that what slows down the learning of new processes to the greatest extent is the resistance to change. Reading through the transcript and the comments, I agree wholeheartedly with most (although I still use keyboard shortcuts before the mouse, if I can). I have stuck with MS office 97, because it DOES what I need, and if I need to convert to .docx/.xlsx for people who are really fussy… I can use google docs to do the converting. For opening .docx, free document reader works very well. I am soon moving from XP (yes I am one of those!) to windows 7 with classic shell (I’ve found the … thing in explorer, I think it’s called ‘breadcrumbs’? and the lack of an ‘up’ button a killer in the system I’ve been trying, but at least I tried right? Looks like a good series. I look forward to the rest of it. Change has been a long time interest of mine. I was often an early adopter of software because I saw new features that would make my life/work easier. “Work smarter, not harder …” has been a favorite motto of mine. I have found that when dealing with someone who is change resistant, the most obvious clue that change may actually be beneficial has been when they bring out their “big gun” phrase. “But we have ALWAYS done it this (old) way …”. I always cringe (internally at the very least) when I hear someone say that. They are always the ones that have the hardest time understanding that you don’t always have to retype stuff, you can copy/paste it or even provide a link to the text. Or that using styles in Word is much faster than applying manual formatting. Or that using Word Heading styles makes creating and updating a table of contents a snap. And in addition you get to play with heading styles in the navigation pane and outline view.